I’d have considered it a bonus if the microphone had been working, but I will get back to that piece of equipment further on in this post. Coming face-to-face with Ilya Kuryakin was good. 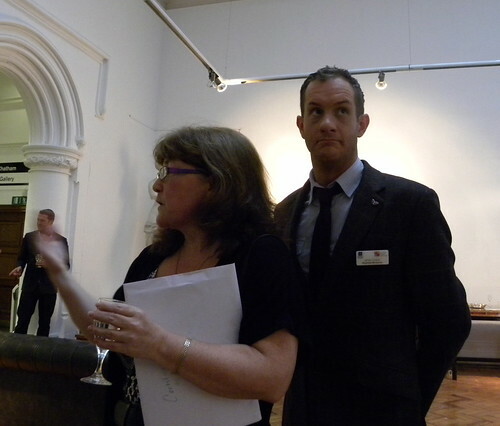 He and that Napoleon Solo were among the first people I ‘met’ on arrival at the Holden Gallery, for the official opening of the mcbf. 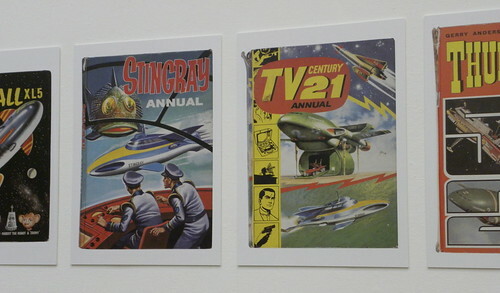 Their colleagues Mr Bond, The Saint and Modesty Blaise were also present, albeit only as exhibits in the new Graphic History of the Future, which by happy coincidence also opened last night. I mingled as best I could. Ran into the Bag Lady of Chinley, so it’s a small world. The other Bag Lady, Iris Feindt, was there wearing new spots, and Liz Kessler and friend mingled, along with Vice-Chancellor John Brooks and Carol Ann Duffy. 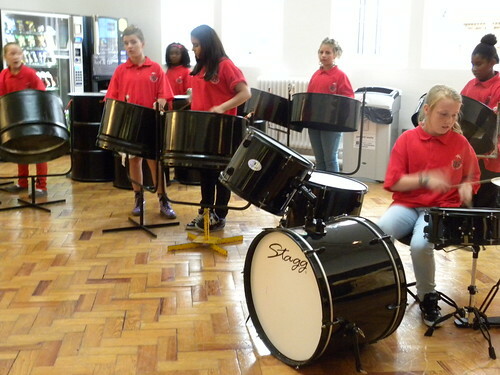 As I went round snapping Captain Scarlett and the Thunderbirds and all those other lovely posters, we were treated to steel drums by the Steel Rockers. Very nice! 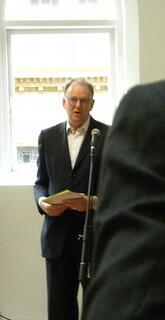 Then the speeches began, and I apologise for being short, and some distance away. 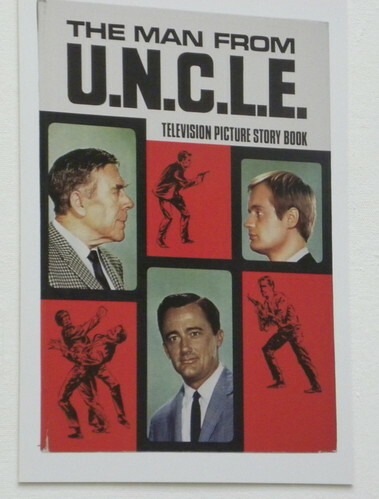 I clearly should not have allowed myself to be lured off-course by The Men From U.N.C.L.E. and instead sat myself down on one of the chesterfield sofas. At the front. Would have been better than standing at the back. Vice-Chancellor John Brooks began by saying what a good idea this book festival business is, praising Kaye and James, and thanking people, left right and centre. Then the Dean took over with more worthy comments on all of the festival happenings. James and Kaye carried on, telling us the background to the festival, which I already knew about. They thanked people. (There should be a limit to how many people you are allowed to name and thank in any one speech.) I’d like to think they thanked me, if only in spirit. The reason I don’t actually know is that we couldn’t hear the first four speakers. The microphone wasn’t doing what it was put there for. I caught words here and there. But what do I know? 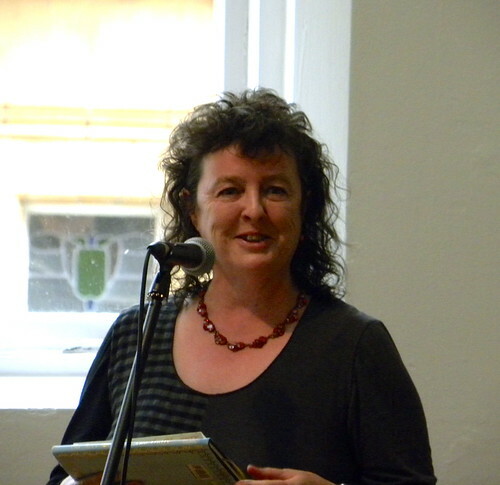 Then came Carol Ann Duffy, and I’d say the microphone was as scared of her as I am, as it instantly sprang into working order. (Could it be the way it is with animals? They sense who is boss.) Carol Ann either read a rude poem, or she didn’t. I’m not sure. After Carol Ann we had another three speakers, but since the poor microphone lost the will to live soon after, I only suspect that they all talked about the exhibition. I wandered off to commune with Ilya. 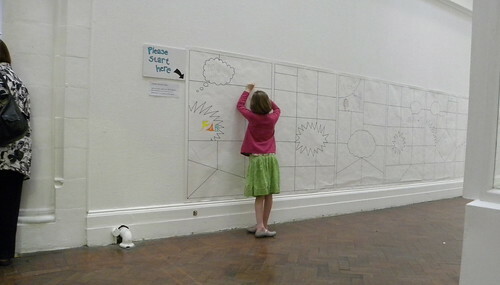 The children who were present drew on the walls, but they were allowed to. I pondered joining them before chickening out on grounds of old age. Once the speeches were over and the chesterfields were free, I sank down in one to rest, startling a gentleman by airing my antique mobile phone, and enjoyed a brief chat with Liz Kessler. In person, not on the phone, I hasten to add. The Steel Rockers played some more and Carol Ann joined in dancing. I wanted to catch Kaye and James together for a photo, and this is what happened. James reckons it describes their working relationship perfectly, but I’m guessing the camel had something to do with Kaye’s dreamy state. James kept flapping his speech in front of him. I’m guessing he was hot. In-house blogger Kevin and I agreed to make things up for our posts, on account of our deficient hearing. He promised to back me up on all that I’ve said here. Or else! Iris seems to want me to get her another bag. I’m not sure. She might be crazy. I’ll find out. Now we just need to be ready bright and early for MMU Plaza for a whole Saturday full of authors and events. And children. Young readers. And between you and me, like so many other venues, it is nicer when its designated users aren’t there. What am I saying? I didn’t mean that. Hundreds of children will enhance the place no end. Looking forward to it. I was there last night to hear whether there is any point in going to uni to learn to write children’s books. Five – or six, depending on your mathematical abilities – authors had come to talk to hopefuls and other interested people about paragraphing and commas, feedback and whingeing. I have doubted that writing courses like the MA offered by the MMU and universities like Kingston and Bath Spa actually do any good, feeling that either you’ve got it or you don’t. But, you know, maybe there is something in this, after all. MMU certainly have a good track record, and Liz Kessler from their very first batch was there to prove how well you can do. 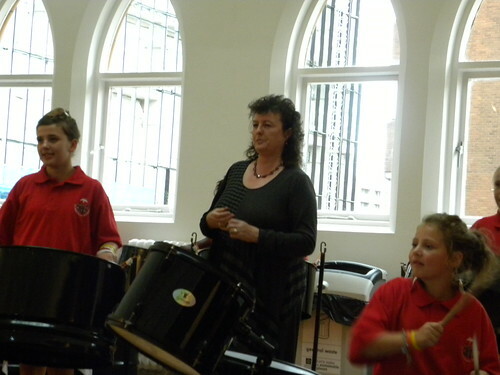 Several of the others both write and teach, and all have had different experiences of learning and publishing. MMU’s Jacqueline Roy chaired the discussion (since Sherry Ashworth had gone off to admire brand new grandchild), noting that all six of them were female. Reviewers, on the other hand, are often male. Nicky Browne reckons she is still learning to write, after all those books she’s written. She writes fast, but only when she feels like it, and then she writes too much. She’s on her third identity as an author, and has temporarily given up her male persona of N M Browne. Liz Kessler told how she wanted to hand back her advance when she found the writing hard going, but once she’d wanted to hand it back for several books, she recognised it as one of the things that happen, and which will pass. You learn through doing. Julia Green’s parents read to her, and her father still checks out children’s books after all these years. 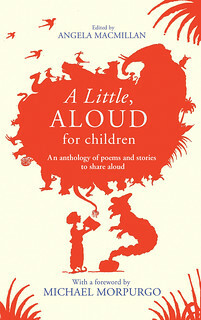 She went on a writing course for David Almond once, and his encouragement was very important to her. Julia now teaches at Bath Spa, and one thing she finds her students doing is polishing their writing for the assessment, rather than for the work itself. Lorrie Porter is a recent MMU graduate, with a contract for two books, the first of which will be published in February next year. She feels that writing is different from most jobs because you need to feel you can do it. ‘Normal’ jobs you just do, without thinking about it. She said it’s vital that you invest time in yourself. And it definitely is harder writing for children, because they will put down a boring book. Iris Feindt was a reluctant reader and a bad speller, but once she learned to like reading and found Enid Blyton, it all changed. She recently graduated from MMU as well, and now teaches there, among other things. She calls herself the Queen of Paragraphing and thinks it’s good to teach, because it helps you learn. Giving feedback to others also helps. Jacqueline Roy starts in the middle, with what she most wants to write. Otherwise she is scared. They all seem to have something they do to fool themselves. Jacqueline mentioned the importance of drafting, when asked for advice. And her editor always points out she has too much food in her books. Julia found it useful realising that revision actually means ‘seeing again,’ and her advice is to consider point of view; making sure you get it right. Nicky warned against trying too hard, and her editor wants her ‘flashing teeth’ to flash a bit less. Iris thinks over-writing is a common mistake. Liz favours ‘show, not tell’ and has her mother to thank for getting rid of lurching stomachs in all her books. Time travel is always risky, and it’s worth keeping in mind that Saturday comes after Friday. Every time. The most important thing is to persist. But an MA in creative writing is no bad thing, and if that’s not feasible, then Arvon came highly recommended. Maybe it was the tea and coconut cake before the event, but I couldn’t help admiring Nicky’s lovely dress. Or Liz’s boots and Julia’s jacket and Lorrie’s lace top. Jacqueline’s armband was great and she out-earringed even Nicky. 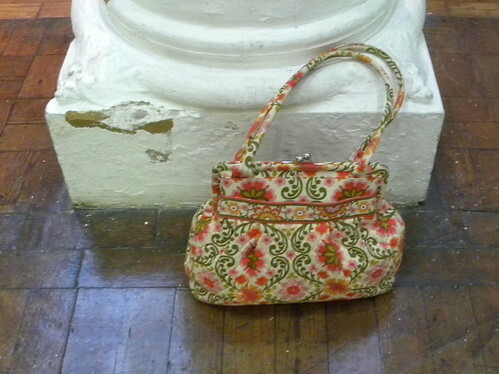 For spotty dress (and I’m not even mentioning her bag) you couldn’t do spottier than Iris. Unless you’re Liz’s Poppy (of pirate dog fame). Her lovely Dalmatian was not present, but we were given to understand that Poppy has adapted well to being famous. This is one anthology that I won’t be able to carry around with me in order to catch all its participating authors for autographs. Many are dead, and anyway, there are so many of them. Many means good, because there is a tremendous variety and choice, and once you’ve read what you fancy, you might pick something you don’t. That way you discover that is actually also perfectly fine. You don’t always get anthologies intended to be read aloud, which of course doesn’t stop you from doing so. Short stories and excerpts and poems are just right for that bedtime read, when you are praying you won’t be sitting on the edge of the bed half the night. This book obligingly tells you how long you can expect to spend reading each contribution, so no nasty surprises. The royalties for this collection of good reads go to The Reader Organisation, which has as its aim ‘reading and health.’ Very nice to see those two words used together. I frequently sit down with a book even when far too many little jobs and crises scream at me that my attention is of the utmost importance. I know that I will feel so much better after a read. Foreworded by Michael Morpurgo (naturally) and with blurbs by Philip Pullman and Stephen Fry (two men whose voices I just love listening to), the book begins with Instructions by Neil Gaiman. I mistakenly thought he was needed to tell us what to do, but it was actually a proper poem. Many of the stories in here are ones I have already read, as part of the novel they hail from or as works in their own right. They have, for instance, had the good taste to pick my favourite Shaun Tan story, Broken Toys. There are excerpts from Siobhan Dowd’s The London Eye Mystery, Joan Aiken’s The Wolves of Willoughby Chase as well as Cosmic by Frank Cottrell Boyce. 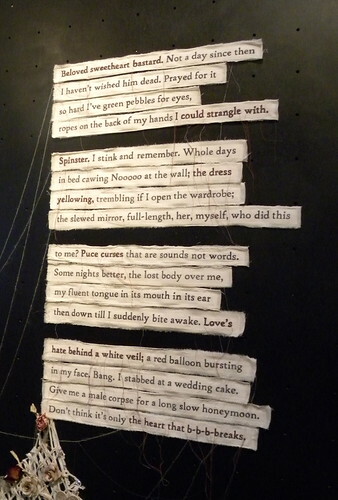 You have Shakespeare and Kipling, Stevenson and Larkin, and even good old Anon. I haven’t read them all. Yet. This is another of those volumes I want to keep somewhere near, just to dip into. The pile for dipping is getting taller, but that just can’t be helped. I will want to dip. Fearing I might not be able to bite you this weekend, I will give you a mixed bag of stuff today instead. Fear. Yes. It’s the done thing. 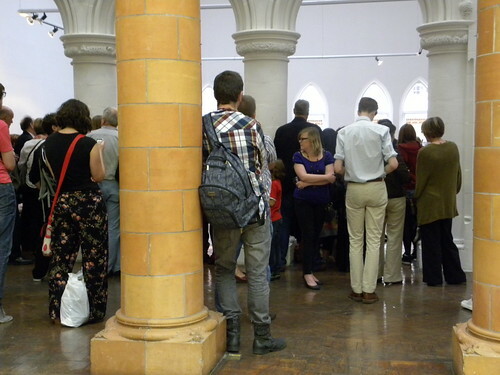 Meg Rosoff blogged the other day about all the dangers of going to the library. Is it safe now to admit to having omitted to fit a stair gate when Offspring were at their most vulnerable? I am a coward most of the time, but there are some things I feel you just need to risk, or we risk (hah) losing sight of common sense. I eat old food, too. 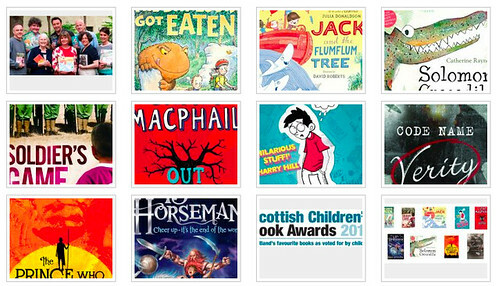 And I am afraid I daren’t say anything about this rather excellent shortlist for the Scottish Children’s Book Awards 2012. The three books for older readers comprise one author whom I admire a great deal (Elizabeth Laird) and the other two just happen to have written what must count as my bestest books (so far) this year, even outside Scotland. That’s Elizabeth Wein (odds that an Elizabeth wins?) and Barry Hutchison. And I see that even more favourites narrowly missed the shortlist. They clearly need a longer shortlist. Or more awards. The younger shortlists (you know what I mean!) are also full of jeopardy, with people being eaten and there being nuts, soldiers, crocodiles and lions. A man who lives dangerously is Tony Higginson of Formby Books. He works too hard. Now he has added to his burden and blogs in his spare (double hah) time. Double danger there next Thursday (and I’m telling you now because I plan to be busy for a while) when he has invited customers to a crime barbecue. I mean, books and flames! Stephen Booth is the one who will be flambéed. Or was that the burgers? This is assuming Tony makes it through his day. I believe I have counted three more events he’s doing that day, which is the day I already have so much on that I am wondering if I can crawl out of bed for the piano tuner at the crack of dawn. I suppose, take one event after another… But no trips for me to the coast and Tony. Next year I’ll send out dates when I’m available. 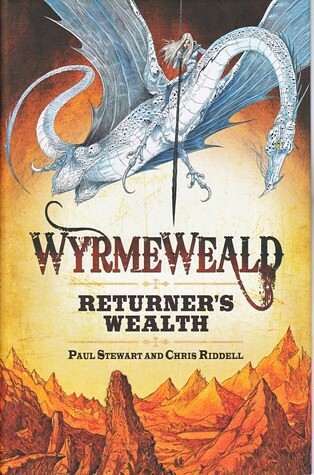 ‘I hope you enjoy this!’ said Chris Riddell when he sent me his and Paul Stewart’s first book in their Wyrmeweald trilogy. So did I. I knew I liked the writing on the jiffybag. It’s not every day you get stuff addressed quite so artistically. Returner’s Wealth is rather like sourdough bread. It’s a long and slow-ish process to begin with, where not much happens. With the bread you know the end result will be worth it, if you’ve eaten it before. If you haven’t, you worry a little that you’ll arrive and find you wished you hadn’t bothered with all that warm water and flour. You realise you don’t like sourdough. It’s good stuff, but not for you. But the jiffybag spurred me on. I wanted to like this book. I just wondered if and when things would happen, and whether I could like the characters, another hundred pages along. I needn’t have worried. It really is sourdough (which I like), and you barely notice as you get to know the characters, and slowly feel that you actively like (some of) them. I even grasped after a while what was going on and why. I’d been afraid I was too thick. Besides, I’m not madly keen on dragon-like creatures per se. Returner’s Wealth is a kind of fantasy western, and the man who teenage boy Micah meets is a Clint Eastwood/Lee Scoresby type. He grows on you. There are ‘dragons.’ Wyrmes. They are birdlike in some ways, and there are very many species of them in the Weald. Some of them have relationships with their own very special human; their ‘kin.’ The others are called ‘kith.’ Some hunt the wyrmes, and others don’t. Micah happens upon some fairly bad kith, and also some really very OK kin. It’s hard to explain what happens. There is some pretty gruesome violence. But above all there is love and trust and respect between some men and some wyrmes. Knowing this was part of a trilogy, I was curious to see how it would end. Would it feel partly finished, or might there be a cliffhanger? Well, I’m obviously not going to tell you. But now that I know I like sourdough I can see myself eating it again. I don’t know how they divide up the work, but Chris’s drawings for each chapter are absolutely beautiful. I still don’t like the dragons, but that’s beside the point. I am not a bad kith. How about a fantastic new fairy tale written by bestselling adult author with her teenage daughter? If you have an open mind you will think this is great and a wonderful achievement, and you’ll want to read it, and when you do, you’ll find a lovely multi-dimensional fairy tale about a handsome prince and an ‘ordinary’ girl, where neither the route taken nor the goal reached at the end is what you thought it would be. We are talking about Jodi Picoult, who writes a novel every year, and does a lot of research for every one. She also has several children, and I think a husband who folds the laundry, or some such thing. That must be why she felt she could squeeze in writing a book with her daughter Samantha ‘while she had nothing better to do.’ The idea for the plot was Samantha’s, and it took them a couple of years to write Between the Lines. Basically we have a (wise but cowardly) prince in a fairy tale, and as you know, when a book isn’t being read, the characters in it have their own lives and can do what they like, rallying to their positions when a reader opens the book. And this prince (Oliver) wants to get out of his book, and when he finally discovers he can talk to (and be heard by) a teenage girl (Delilah), they fall in love and then they try to come up with a way for Oliver to get out. Told on three levels, the fairy tale, Oliver’s ordinary life and Delilah’s life, we meet the characters from the fairy tale both as the characters they are supposed to be, as well as who they are in their spare time. 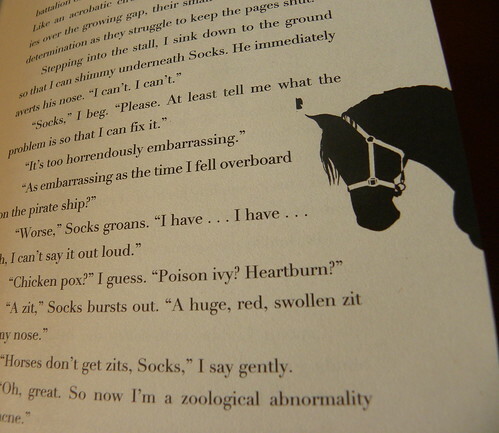 And I just love Socks, the prince’s faithful horse! At one point I did wonder if I should side with Delilah’s mother who thinks her daughter has become unhinged, talking to a children’s book. No one else seems to hear Oliver, although it doesn’t help that he clams up when others are near. You wonder how on earth this can be resolved, and I very much doubt that anyone can guess correctly. It’s different, and it’s a great deal of fun. Illustrated throughout with lovely pictures by Yvonne Gilbert and Scott M Fischer. 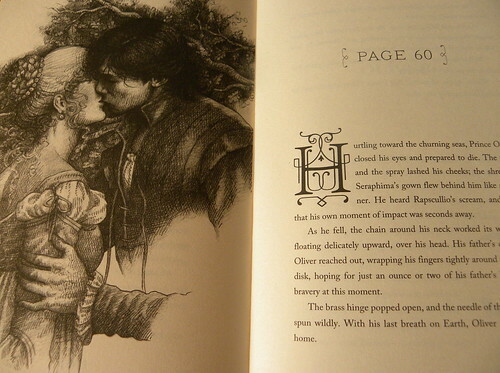 Just think, if the pictures weren’t there, Oliver and Delilah wouldn’t be able to meet, or fall in love. Deciding not to get the hoover out after all, or sorting out that food shopping list, or even delaying writing the blog post that’s so urgent, can be a good thing. Other than providing some rest for the procrastinator, I mean. It could be a sign that the book I’m reading is so moreish that I simply can’t tear myself away. Well, maybe I can, but I will be back in my reading chair much sooner than intended. In a way it’s strange that I have to have thoughts like this. If you read for pleasure, shouldn’t all books be enjoyable as a matter of course? They should, but aren’t always. Sometimes I haven’t thought the thought out loud until I find myself not creeping back to the chair to pick the book up again. And that feels so sad. And wrong. That’s when I have to think carefully about whether I should put the book away and start another one. One that will definitely keep me from doing housework, and that I race to finish, only to be annoyed because I got to the end and I will have to find something else to replace it, and I’m certain I won’t be able to find a book anywhere near as wonderful. Luckily, there are many anti-hoover books in this world. Shame about the others. The timewasters.